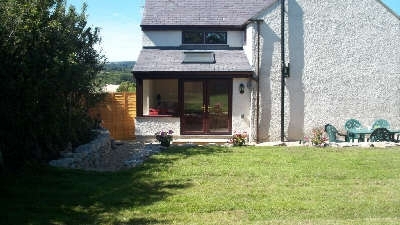 This traditional Welsh country cottage is situated on the coast in a designated area of outstanding natural beauty (ANOB). In 2008 the Cottage was renovated and extended. 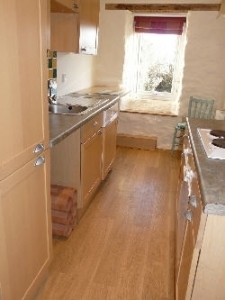 It is in a superb position just two minutes walk from the large sandy beach at Lligwy and the coastal footpath. The seaside village of Moelfre is only a mile away. 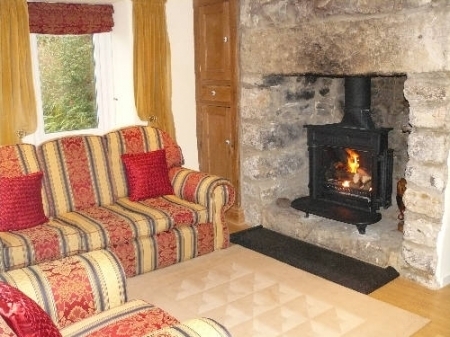 This charming cottage is in a peaceful setting with sea and countryside views. The Sun Room is south facing overlooking the garden - it has french doors and is furnished with two sofas along with a dining table seating 5 persons. Reception Rooms - the Sitting Room most impressive feature is the large original stone inglenook fireplace with cast iron stove which when lit produces the atmosphere of a traditional open fireplace. The Sitting Room is furnished with a 3 seater sofa and 2 armchairs along with TV and DVD. Bedrooms - 3 bedrooms comprising a super king or twin room, one double and one single. Bathrooms - 2 bathrooms - upstairs is a shower, w.c. and wash hand basin whilst the downstairs bathroom comprises a whirlpool spa/bath, large seperate shower, w.c. and wash hand basin - both bathrooms have shaver sockets. Kitchen - fitted with beech wood units the kitchen is fully equipped including a dishwasher, microwave, fridge/freezer and electric oven, hob and extractor fan. A feature of this room is the original stone wall with a built in window seat overlooking the garden. Garden with garden furniture and BBQ. Full oil fired central heating (with individual controls on each radiator) and electricity are included in the holiday cost. Firewood and bed linen is also supplied. Within a few minutes walk of the cottage are two coastal public footpaths going in opposite directions from the beach. One follows the cliff edge to the village of Moelfre, the other along cliffs, coves and beaches to Dulas Estuary where it turns inland up over a hill ending at the Pilot Boat Inn. Also, within a ten minute walk is an Ancient Monument site; the ancient village known as Din Lligwy Hut Group, where there is also a Neolithic and early Bronze Age burial chamber and a derelict 16th Century church. Off road parking available for 2/3 cars and a boat. You must be over 18 years old when you book a holiday. 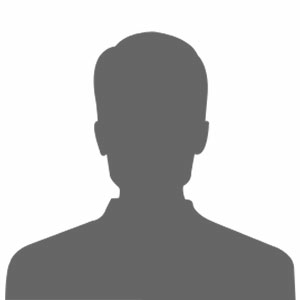 Only those persons named on the application form may stay at the property or use its facilities. Requests for changes in numbers or other particulars will be considered wherever possible. Booking periods start at 2.00 pm on day of arrival and end at 10.00 am on day of departure. 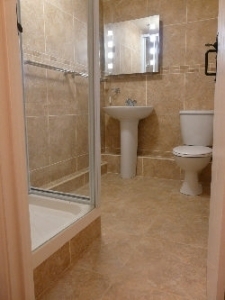 You agree to keep the accommodation clean and tidy, and leave the property in a similar condition as found on arrival. You are responsible for costs of any cleaning, breakages or damage in or to the property - along with any additional costs which may result - which are caused by you or your party. Fair wear and tear accepted. When booking your holiday you will be required to pay a booking fee/deposit equal to 1/3rd of the holiday price. In the event of cancellation we will do our best to re-let the accommodation. If successful we will refund your deposit less a cancellation/administration charge of Â£25 per property per week. However if we are unable to re-let the property and written notice of the cancellation was received more than six weeks prior to the arrival date only the deposit is forfeited - for cancellations less than six weeks prior to arrival the whole cost of the holiday is forfeited - as such holiday insurance is recommended. We would not expect to make changes to your booking, but sometimes circumstances dictate that we have to make alterations - if this does happen we will contact you as soon as reasonably possible, explain what has happened and inform you of cancellation or change. If we have to change something (and the change is not acceptable to you) or if we have to cancel your booking, we will if possible and as soon as is reasonably practical, arrange alternative accommodation. If the alternative is not acceptable or no alternative can be found we will refund in full all monies paid and be under no other liability. Upon receipt of your deposit you will be sent written confirmation of your booking showing your holiday details and the balance of the cost which MUST BE RECEIVED SIX WEEKS BEFORE YOUR ARRIVAL DATE. For bookings received less than six weeks before the start of the holiday or short breaks payment in full is due immediately. Pets are allowed only with permission at time of booking - please request at time of booking. Pets are charged at Â£15 per week or Â£10 for short break. Pets are not allowed on beds and furniture AND MUST NEVER BE LEFT IN THE PROPERTY ALONE. For guests bringing pets a Â£50 deposit is payable on arrival to be held in the event of any damage or extra cleaning required due to pets. Guests must remove all trace, inside and outside the property, of pet occupation before departure otherwise the full Â£50 deposit will be forfeited. The pet deposit will be refunded on departure if no costs are incurred.